Creating Transformative Encounters è un laboratorio teatrale che utilizza la metodologia denominata human specific, incentrata sull’interconnessione, sull’interattività tra i partecipanti e sulla capacità del performer di lavorare in spazi differenti, principalmente fuori dal palcoscenico del teatro classico. Il workshop intensivo, della durata di nove giorni, è rivolto ad artisti, creatori teatrali e professionisti del campo teatrale. Il corso, aperto a un massimo di dieci partecipanti, è tenuto in lingua inglese. A cura di Cantabile2 (DK). 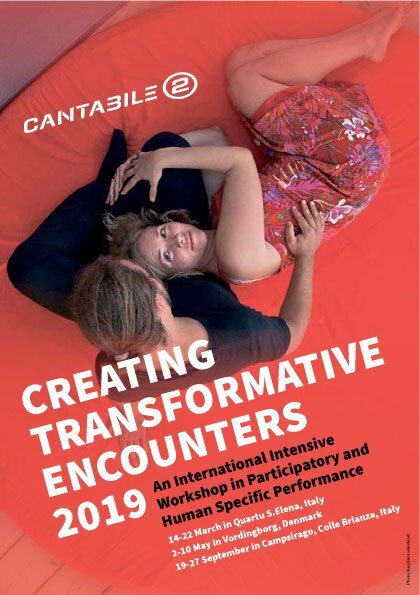 Creating Transformative Encounters is a workshop in Participatory and Human Specific Performance open to English-speaking participants from all countries, and all teaching will be in English. The workshop is addressed at professional performers, live artists, theatre makers and other professionals with interest in close encounters between individuals. The nine days long, intensive workshop will be focused on exploring interactivity, participation and intimacy in different spaces, mainly away from the classical theatre stage. Participants will investigate in which ways emotional and sensorial responses are created together with the participating audience, through sincere, non-fictionbased communication. The boundaries for intimacy between strangers will be challenged, evoking authentic, receptive and trusting modalities of participation. A lot of focus will also be put on exploring and creating performative, interactive games and rituals between participating audience and performer. The students will experiment with developing participation based on interactions, drawing inspiration from both traditional ceremonies and from computer based adventure games, and modern board games. • The creation of a sensorial universe. Devising and guiding sensorial experiences. • Relating to a participating audience within a structure of personal interaction. • Exploring borders of emotional and intellectual interaction. • Using non-traditional spaces for framing experiences with journey-like structures. • The creation of a true personal connection, within a set frame of a performative universe. • Use of personal, biographical material outside of the typical storytelling frames. • Different forms of open dramaturgy, labyrinth-like performance structures. • Creation of small interactive group dramaturgies. • Risk taking: the performer in the double role of guide and protagonist. • Physical contact with a participating audience. • Creating a non-invasive environment for bodily communication.